Tabitha Byrd is trying to get her ducks in order. The 31-year-old mother of two was in crisis when her father traveled to Boston two weeks ago to bring her home to Ann Arbor, setting up two twin beds and a crib in the living room. Byrd is sharing the house with her father, stepmother and two teenage sisters. 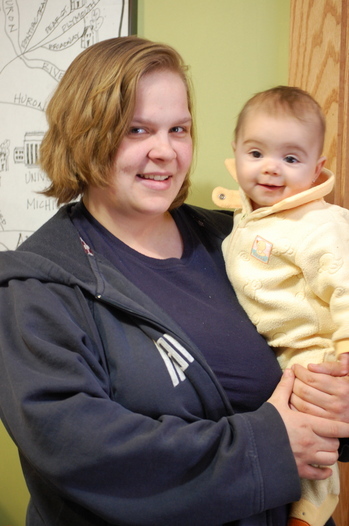 Tabitha Byrd, with 5-month old daughter, Lily Noe, submitted an application for the waitlist. Byrd and her two children are currently living with her father, stepmother and two teenage sisters. Byrd and her children sleep on twin beds and in a crib set up in her father's living room. While she is grateful for the help, it’s not easy, Byrd said. “It’s an inconvenient situation.” She has found a child care job, has enrolled at Washtenaw Community College for spring classes and wants to find her own place where she can raise her daughters, who are 9 years old and 5 months old. She’s hoping an application for a spot on the waitlist of Avalon Housing, Inc. will be her ticket to independence and a new life. “I just want to do for myself, I don’t care if it’s a house, an apartment or even an RV. I just want to be able to support my family on my own,” Byrd said. Applications for one of the 75 spots on the Avalon waitlist have been spilling in since the two-week window opened Feb. 6. In just two days, 70 applications were submitted, and 400 to 500 more are expected by the Friday deadline. “The demand is so huge and our turnover is not great,” said Carole McCabe, executive director. The waitlist will be created through a computer-generated lottery. While Avalon decided creating an annual waitlist is the best way to fill openings, it’s still heartbreaking, McCabe said. Employees who staff the desk and hear applicants' stories go home crying, she said. Many applicants live in shelters or are homeless. Many found temporary refuge in the homes of family and friends. Some pay rent but are living on the edge, spending 75 percent of their income on rent and are one car repair or health bill away from being evicted.
. We take pride in screening tenants who most landlords screen out.” Avalon also offers support services. Applicants must have a source of income and earn less than $18,000 annually for singles ($25,000 for a family of four). The average annual household income for Avalon residents is $11,000, McCabe said. Some housing is targeted for specific groups, such as survivors of domestic violence or the chronically homeless. 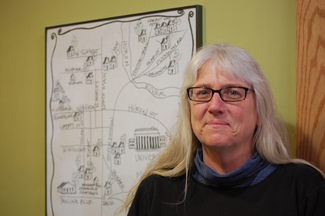 Carole McCabe, executive director of Avalon House, Inc. The private nonprofit is in the middle of a two-week window for applications to the waitlist. The deadline is Feb. 17. While the agency expects to receive hundreds of applications, only 75 will be placed on the waitlist. It’s not a giveaway program. Tenants must pay rent - and have been evicted when they stop - based on family size and location. A single person in a sleeping room or small efficiency pays $260 a month while a family will pay $414 for a three-bedroom townhouse at Carrot Way Apartments. The majority of tenants work at least part time, although others, such as those with a mental illness, are on Social Security, McCabe said. One way to keep rents low is to hold no debt on its properties, McCabe said. Avalon uses federal and state sources, such as low income housing tax credits and funds from the Michigan Housing Development Authority, to buy properties and rental income, grants and fundraising are used to operate the properties. There are two new properties in the pipeline: Apartments at 1500 Pauline will be demolished and replaced by a 32-unit complex, and houses on North Main Street will be demolished and replaced by a 39-unit project which will include space for so-called “work force housing,” where rents will be below market but higher than other Avalon housing prices. Both are expected to be opened to tenants in 2013 and are expected to increase the size of the 2013 waitlist, McCabe said. With 500 to 600 people just wanting a spot on a waitlist, the need is obvious, McCabe said. “We grow slowly and steadily, but we try not to get ahead of what we can support.” The Washtenaw Housing Alliance produced a report that said 500 more affordable housing units are needed to meet demand, she said. Mon, Feb 13, 2012 : 8:01 p.m. So now any comment that doesn't embrace the progressiveness of the article is considered &quot;A comment that violated AnnArbor.com's conversation guidelines&quot;.. Have you ever heard of freedom of speech? Is it only from &quot;left&quot; leaning speech? This time you have gone to far! I am embarrassed for your readers that consider you a news source. Might just as well be <a href="http://www.AnnArborPress Release" rel='nofollow'>www.AnnArborPress Release</a> for Progressives.com . I am not speculating why the young mother is in the situation she is or placing blame but even though the arrangement of living with her parents is "an inconvenient situation&quot; and is not ideal she is not homeless. This is the way many cultures live, with extended family under one roof and children sharing rooms, economically it makes the most sense for all involved, sharing costs and yes childcare (or reduced if she were to say pay a sibling to babysit). Many people get into trouble financially because of housing costs, it's not just the roof over your head, it is needing pots and pans and dishes, sheets and towels and other household items. Many elderly end up having to move back in with their adult children for care b/c it makes the most economic sense. So even with paying Avalon housing rates this young women will have a harder time bringing herself out of poverty than if she were able to stay longer with her family. Granted the stepmother or others might not like it but family is family and you sign up for all of it when you are in a family. The family should look at helping her by letting her stay there longer as sowing the seeds for reaping a better relationship or help with their own hardships they might encounter further down the line. Mon, Feb 13, 2012 : 6:58 p.m. I agree that our subsidized housing should go to people who have lived in this area and have been unable to secure housing. I'm sure there are families who do not have the safety net of parents and relatives to live with. It may be crowded, but it is housing. Mon, Feb 13, 2012 : 4:53 p.m.
Mon, Feb 13, 2012 : 4:42 p.m.
Why has our city and county leadership failed us so badly in the promotion of affordable housing? Why do they not look to models which are working -- such as any of the cooperatively owned townhouse communities in the city -- and repeat them? Is it a lack of will or a lack of imagination? And I would like to think that my neighbors in this readership area were able to understand from the article and from opening their eyes to the world around them that there is profound need here and many impediments to self-improvement. They need to ask themselves what they are doing to improve their neighbors' lives, rather than spending hour after hour filing the spaces after these articles with the evidence of their selfishness and lack of compassion. Mon, Feb 13, 2012 : 3:41 p.m.
Get a better job that pays more than minimum wage. Mon, Feb 13, 2012 : 8 p.m.
A whopping 250 jobs? Wow. Also in Washtenaw County over 10,000 are unemployed and tens of thousands of more underemployed. 250 jobs is statistically insignificant. Mon, Feb 13, 2012 : 6:52 p.m.
Tru2Blu76, I was wondering when someone would bring politics into this. It didn't take long. Mon, Feb 13, 2012 : 6:37 p.m.
That's easy to say, but what about the issue of being able to create adequate opportunity for yourself? In this area, even with a degree of some kind being able to land a good paying job is not a given. Yes, we are all, as adults, responsible for choosing our path in life, but there are, esp. in a bad economy times when you just need a hand. Mon, Feb 13, 2012 : 5:33 p.m. Here you go. <a href="https://www.michworks.org/mtb/jobSearch.do" rel='nofollow'>https://www.michworks.org/mtb/jobSearch.do</a> 250 in AA alone. With the &quot;you'll never make it&quot; attitude we see here, no wonder these guys are on the dole forever. Isn't this the same attitude teachers are accused of as part of the disparity in learning between the races? Don't perpetuate it. Mon, Feb 13, 2012 : 4:38 p.m.
Mon, Feb 13, 2012 : 4:35 p.m. I suppose the Republican Party has lots of leftover jobs like that they can spread around, eh? Oh Darn! I forgot: the Republican solution is for everyone to get THREE low-paying jobs to replace the middle class jobs they single-handedly eliminated. Mon, Feb 13, 2012 : 2:35 p.m. It would be helpful if this article included Avalons success rate for its residents gaining &quot;Independance&quot;. In many peoples eyes, this is simply warehousing of the needy. What is the turnover rate? What is the average length of residence with them? What steps does Avalon take to nudge them into Independance? With the many recent disclosures of charities being guilty of using their funds for other purposes than helping the needy, it would be helpful with fundraising if Avalon published the percentage of its income dedicated to overhead. Mon, Feb 13, 2012 : 7:52 p.m.
You guys act like jobs are just falling off trees. Don't you think if there were as many jobs as you think there are the unemployment rate would be near zero? Or do you really think upwards of 40% (included citizens that would like to work full time/more but can't) of the population is just 'lazy?' And yeah, I do think people should wait until they are more financially stable to have kids (though you have to also understand that even financially stable people can lose their jobs). It's one of the best arguments for legalized abortion. Mon, Feb 13, 2012 : 7:46 p.m.
Well Picker I am one of their success stories, I don't know that it can be really analyzed in the way you are wanting it to be. When I did live on their property with my 2 children 15+ yrs ago, there were lots of Mentally Ill and Disabled who were tenants who categorically were not able to work. Let me add I may not have needed Avalon, if at the time, the state had seriously enforced a court order for Child Support! I am still owed to this day $65k, if I had that $ when my kids were growing up, it would have made a world of difference. Still I managed to work myself off of all assistance, then Avalon, and then about 5 yrs later became a home owner in my own right. So yes if you apply yourself and want it bad enough Avalon is a helping hand, not a way of life! Avalon is one of the best if not the best programs around! Best way for the Picker to have his questions answered? Do volunteer work for Avalon. Mon, Feb 13, 2012 : 4:37 p.m.
Work two jobs. That would be $28k per year. Additionally, wait until you are financially stable before you start a family. It might also help to wait until you are married or in a situation where you can provide a two-p parent household before you start having children. With a minimum wage that pays a full time worker about $14,000 (before taxes) and rent in a single apartment averaging $9000 per year, tell me, how are people supposed to become independent? Mon, Feb 13, 2012 : 2:32 p.m.
And all along I thought we were the richest nation on earth and looked out for each other. My, my, my, how times have changed... maybe they didn't change at all. Ignatz, that is actually not true. The first settlers took care of thier own, they were bonded together through hardwork and more importantly Church. Churches took care of thier own too. Followers often would go to Church elders to ask for help and received it, whether it was food, blankets or a job. Hospitals and orphanages were religious institutions, not governmental. Church way of life was very much American way of life. Americans donate more money than other &quot;rich&quot; nations. We gave more money than anyone else for the Haiti earthquake and the Japanese Tsunami and other disasters worldwide. Many people tithe to religious institutions, which spend and deal with the money more effectively than government programs (higher % of each dollar spent on doing good rather than discussing it). They also don't just spend the money on prothelytizing the Word but in helping people with the most basic human needs. You want to know how well your donations are spent do reserch on how much of each dollar actually goes to doing the works than how much goes to fundraising and administration costs. Mon, Feb 13, 2012 : 6:53 p.m. Taking care of our fellow citizens has never been an American trait, unless there was a way to make a buck off of it. Mon, Feb 13, 2012 : 2:18 p.m. I hope that Avalon rents to people who have been living in this area first. Moving here just to go from one to dole to another is not acceptable. We have more than enough actual Washtenaw County families needing help. Mon, Feb 13, 2012 : 1:32 p.m. Excuse me, Ally. If more than 500 families will continue to wait for a place, it sounds as if the safety net has too many holes in it. in this womans case she does have a safety net, it's called family, something that was clearly stated in the article. The gov't safety net should be the absolute last resort. Mon, Feb 13, 2012 : 12:06 p.m.
Avalon does a heroic job. They know that housing is not enough - there have to be supportive services for people. So much for the &quot;very poor having a safety net&quot;. That safety net is in tatters, and worse may be coming in the future because of the lack of understanding and support in Washington and Lansing. Mon, Feb 13, 2012 : 8:05 p.m.
You seriousely believe there are no supportive services for people? How about 41%!! ?Social Security: Another 20 percent of the budget, or $707 billion, paid for Social Security, which provided retirement benefits averaging $1,175 per month to 34.6 million retired workers in December 2010. Social Security also provided benefits to 2.9 million spouses and children of retired workers, 6.4 million surviving children and spouses of deceased workers, and 10.2 million disabled workers and their eligible dependents in December 2010. ?Medicare, Medicaid, and CHIP: Three health insurance programs — Medicare, Medicaid, and the Children's Health Insurance Program (CHIP) — together accounted for 21 percent of the budget in 2010, or $732 billion. Nearly two-thirds of this amount, or $452 billion, went to Medicare, which provides health coverage to around 47 million people who are over the age of 65 or have disabilities. The remainder of this category funds Medicaid and CHIP, which in a typical month in 2010 will provide health care or long-term care to about 60 million low-income children, parents, elderly people, and people with disabilities. Both Medicaid and CHIP require matching payments from the states. It is sad that some people are so selfish, greedy and resentful that they cannot abide a charity using available government programs as part of its funding to help the poorest among us with the most basic of needs. Perhaps a representative of the 1% as claimed, but not the middle class. Mon, Feb 13, 2012 : 12:50 p.m.
&quot;Avalon uses federal and state sources, such as low income housing tax credits and funds from the Michigan Housing Development Authority, to buy properties and rental income, grants and fundraising are used to operate the properties.&quot;.... Sounds like a safety net to me, also sounds like we (the middle class and 1%) are paying for it.